The Brooks PureGrit 6 fills the "natural running" slot in the Brooks Trail line, providing a great balance of trail feel, protection, comfort and genuine all mountain/all trail capabilities. Brooks was generous to supply both my wife Allison and I with a cute his/hers set of PureGrit 6 for review, as I was eager to see how the PureGrit has evolved since version 3, which I liked and Allison called the best shoe she has ever worn. How has the PureGrit improved over the last few iterations? The upper is the most noticeable change to the PureGrit 6 and sits atop essentially the same midsole/outsole as the previous PureGrit 5. The PureGrit 6 comprises of a very attractive cloth like mesh upper with a knit like look with an array of rubber 3D printed overlays to provide strategic support, structure and durability where needed. The toe bumper is actually integrated with the protective "360 degree" mudguard that wraps around most of the shoe as a buffer between the upper and the midsole (~270 degrees is closer to accurate, as it is discontinuous for a good portion of the medial side of the shoe). The toe bumper is moderately protective and integrates nicely with the shoe. The heel collar is on the low side, but supportive and very well padded. Heel hold is excellent and very comfortable. The heel counter is well structured, supportive and protective. The gusseted tongue is on the thin side, but adequately comfortable, where the laces can not be felt. The PureGrit 6 has a nice wrapped booty like fit with the added security of the snugly gusseted tongue. The laces are just the right weight/thickness and have a perfect amount of give/stretch for achieving a nice locked in and comfortable fit on the first try. No need for re-ties or adjustments during a run. There is also a lace garage at the top of the tongue if you so choose to tuck the laces in. It is a nice touch, but I am usually in too big of a hurry, or too lazy or just too forgetful to ever use a lace garage (unless I have to, such as I would with a Salomon shoe for example). Fit is true to size with great heel hold, great midfoot hold and good forefoot security. There is not too much extra room in the forefoot for my average to low volume foot, but the upper has a really accommodating level of stretch and give, without compromising too much security. The BioMoGo DNA midsole offers up firm and responsive cushioning, relatively protective for a "natural running" shoe. I find the cushion to be adequate for mid to shorter distance runs on generally softer to moderate terrain. With 21/17mm of stack, it is a bit less than I prefer for my daily rocky trails, but is generally adequate and not so thin that one needs to really carefully tip toe in rocky terrain. One minor change is that the strobel has changed from EVA to mesh, offering a slight weight reduction, but perhaps also compromising a bit of cushion. The outsole of the PureGrit 6 is littered with sticky, hexagonal lugs that provide excellent traction in a wide variety of conditions. The lugs are densely spaced enough that running on road or hard surfaces is not a problem, as the distribution of weight/force on the lugs is spread out well. I find that these shoes run well on roads, but would want to keep that to a minimum with the somewhat thin and firm cushioning. Perhaps not a true door to trail shoe, but can handle a few miles of pavement here and there. The Omega Flex Grooves in the forefoot contribute to a natural flex and feel, without feeling too flexible or flimsy. There is also a Ballistic Rock Shield to help guard from stone bruising and hard steps on sharp objects. Jeff: Overall, I find the PureGrit 6 to be a joy to run in for shorter runs (up to 2 hours) on mellow to moderate terrain where I will not be as worried about cushioning on rocky technical terrain. The PureGrit 6 can handle just about anything for short periods of time, but when the going gets tough, I usually look for more cushion and protection than the PureGrit 6 offers. The PureGrit 6 is reasonably quick and responsive and can perhaps be considered as a race shoe, but for racing I would likely look to the much more responsive (and lighter) Mazama, or even the Caldera for longer distances or just wanting more cushion. 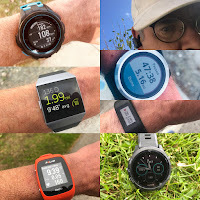 The PureGrit 6 is in my opinion, a great daily trainer for runs up to ~2 hours. Though upper security is quite good under most circumstances, when pushing hard on steep, off trail terrain, sidehilling or pushing corners, my foot will waver a bit inside, enough to cause me to back off some. I also found heel landing stability to be only OK at best, less than ideal for dedicated heel strikers. Since this is a "natural running" shoe, it is hard to be too critical, as this shoe is designed for the mid to forefoot striker, but a bit more crash pad substance (width and cushion) would be appreciated. Allison: The PureGrit 3 was perhaps my favorite shoe of all time, which I put probably twice the miles I would on any other shoe. 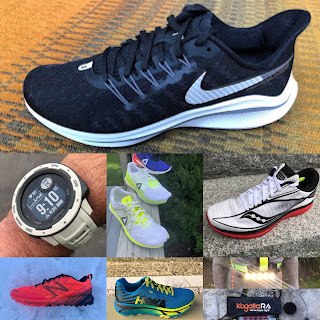 I have tested/reviewed shoes for some time and have 20+ shoes to choose from on my shelf, but most always would go for the PureGrit 3, despite having worn it down to nothing. Receiving a new pair of PureGrit 6 was exciting to say the least and I am very impressed with the improvements to the upper. Fit, comfort and looks are all improved and the upper gives great security and protection. The outsole/midsole took some breaking in for me, such that for the first few runs I was not entirely sure if the PureGrit 6 equaled or improved upon the PureGrit 3, but eventually I have come to enjoy it at least as much. I will say though that my expectations of a shoe have shifted somewhat over time, expecting a little more cushion at the same or less weight. I agree with Jeff, as I find the PureGrit 6 to be well suited as a daily trainer for shorter, moderate runs. Brooks PureGrit 6 vs. Brooks Mazama (RTR review here): The Mazama is lighter, more responsive and has better foothold for pushing at fast paces. Additionally, the Mazama has 2mm more cushion in the heel, which is definitely helpful. The PureGrit 6 however has a more comfortable upper and a much more durable and grippy outsole for a wider variety of trail conditions. Brooks PureGrit 6 vs. Brooks Caldera (RTR review here): The Caldera has 4mm more of cushion, plush cushion that is, for only a slight weight penalty. The Caldera is far superior if you want more comfort and impact protection, particularly on longer runs up to 50 mile to 100k. The PureGrit 6 has a grippier outsole for a wider variety of conditions. Brooks PureGrit 6 vs. Saucony Koa TR (RTR review here): Both have a 4mm drop, very nice modern uppers and are close in stack height (1mm more for the Koa TR). The Koa TR is a bit heavier, but in my opinion, offers a smoother, more forgiving ride with a bit more plush cushion. The Koa TR makes for a better door to trail shoe with the more minimal lugs and better cushion and also is a bit more stable. Brooks PureGrit 6 vs. Salomon Sense Ride (RTR coming soon): The Sense Ride is slightly heavier, but offers far superior ride, stability and cushioning with the Vibe and Opal insert. The Sense Ride also has the Premium Conta-Grip wet traction that is tough to beat for a very wide variety of conditions and surfaces. Both shoes are $120. The PureGrit were provided at no charge. The opinions herein are entirely the authors'. The Brooks PureGrit 6 is available now from the stores below! I agree 100% with Allison that the PureGrit 3 is my favorite shoe of all time. In fact I was even to the point of wearing for all my road runs as well. I had two pairs that I alternated, and almost bought a third pair on clearance but regretably did not. Then they sold out and my beloved shoe was gone forever. Since Allison seems to have the same likes as me in a shoe, I am excited to try the 6. My main complaint with Brooks Pure iterations 4 & 5 was a narrow toe box. If the 6 upper fits as comforatbly as the 3 I will by 5 pairs. LOL!